Ludwig Burmester was a nineteenth century German mathematician. His Lehrbuch der Kinematik, Erster Band, Die ebene Bewegung (Textbook of Kinematics, First Volume, Planar Motion), of 1888, contains the first far-reaching attempt at a synthesis of theoretical kinematics and kinematics of mechanisms. His most influential technical contribution is the Burmester theory which deals with four or five discrete positions of a moving plane. The goal of the Burmester theory is the synthesis of mechanisms. 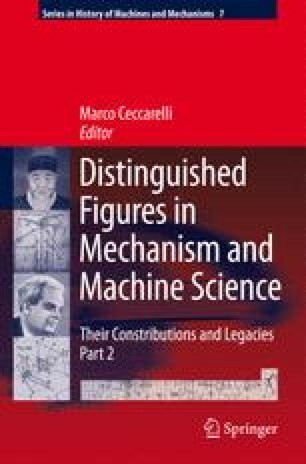 In the present paper, Burmester’s work is discussed against the background of the development of the theory of machines and mechanisms in the nineteenth century. I am very grateful to Frau Judith Winkler (Kreuth beim Tegernsee, the village where Burmester was buried) for her help and to Dr. Klaus Mauersberger (T.U. Dresden) for critically commenting on an earlier version of this paper.